There were swells coming in today which churned up the water, reducing visibility but we wanted to snorkel and so decided to head out to Scott's Head in hopes that the water would be calmer since it was better protected. At the risk of being repetitious, I wanted to cover Dominica roads one more time. They are challenging, not because they are so narrow - roads in Europe can be just as narrow. It's not because of the numerous potholes, I've seen roads with just as many in other Caribbean countries and even in parts of the US. It's not because of the steepness of the mountain roads, roads in Colorado can be just as steep (well, almost, we measured 30 to 40 degree upward angles on some of the roads!) The biggest difference is the total absence of a shoulder and the sheer drop offs where the side of the road ends. Put all of the above together and throw in the fact that they drive on the left like the British and the cars have the driver in the right seat - and you can have a very interesting experience. Despite all that, I never saw an accident except for the one I was involved in when I was hit from the rear. Still, the drivers were invariably polite and helpful. 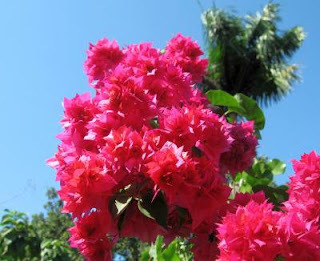 In fact, every Dominican I met was extremely polite, friendly and eager to provide help, it's a very friendly country. Now, back to the roads. We've been out to Scott's Head about a dozen times, traveling over the same road. It is not for the faint of heart since several sections of the road is just wide enough for 1.5 cars and there are no guardrails. The sea side of the road is a sheer drop to the ocean about 10 feet below. There are no guard rails (did I say that before?) Since I was always the driver, I couldn't take photos and there's no place to stop! However, I did find this YouTube video of a couple driving the same road (click on unlined link). He filmed the chicken version, going on the land side of the road. The fun part is on the drive back where you are the car next to the ocean with the vertical drop and another car comes - and you have to squeeze over to the left to let him pass on the land side, the right. I got complaints from the passengers (who sit on the left side, next to the ocean) who had a very good view of the rocky beach just below them by looking down and out their window! According to passenger reports, the left wheels typically got within 6 inches (or choser!) of the drop off when I had to squeeze over for on oncoming car or to miss a pothole. Driving in the mountains presented a different experience. The curves were typically switchbacks with a change of direction of 180 degrees along with a very steep road. In this case, the road ends at the pavement and if you wander beyond it, you will simply depart the road sideways, finding out just how deep that ravine really is! Once again, here's another YouTube video of a road that we've been on but you don't get a good sense of the thrill since no buses were passed. By the way, a tour bus can take up more than one lane and you can't see that far ahead when navigating a switchback so the custom in Dominica is to honk your horn when entering a curve (you can hear it in the video) so an oncoming car or bus knows someone is coming. Unfortunately, some of the worse potholes are on the inside of a curve so the tendency is to swerve out into the middle of the road to miss them, not good! I've included a section of the road in front of the condo we stayed at, The Titiwi Inn. Note the two foot deep, concrete drainage ditch, if you get a tire in that, it's not coming out anytime soon! 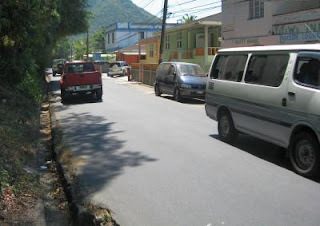 Such ditches line most of the roads in Dominica to keep the roads from washing out during the rainy season. 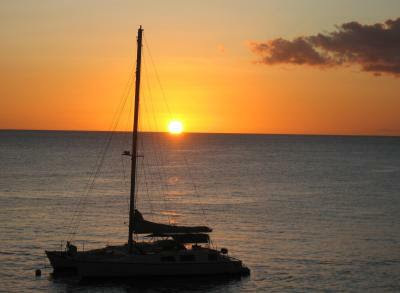 After all the excitement of driving, we had our usual rum punch and watched the sunset for the night. It's excellent entertainment and always a good view, we never tired of it. We were on our way to shop for groceries this morning and heard a screeching from behind and then a "thump" - I was hit from behind by a minivan! The damage to my rental car was minimal but the minivan suffered a cracked headlight assembly and bent metal around the lens. The owner of the condo where we were renting came out and he was instrumental in communications with the driver of the minivan in getting all the pertinent information. I took photos of the damage including the skid marks of the minivan before he rear-ended us. It was very evident that the minivan was going too fast. Once that excitement was out of the way, we trekked into town for groceries and found it was the last day of the month when everybody got paid - the stores were packed! A 5 minute checkout turned into an hour. Oh well, we finally got through the line and back home. After lunch we chose to snorkel Champagne Reef. It's a unique area that sports underwater vents with escaping gas that looks like champagne bubbles rising through the water. It's all very pretty (see photo). We too our usual photos of interesting fish and enjoyed ourselves for two hours. At TiTiwi Inn we have excellent WiFi access to the internet and so I checked up on the status of the Dutchess County storm. I e-mailed one of our neighbors and found that the area was out of power for 32 hours! We feel pretty helpless down here in Dominica, even telephone service is hard to get - but thank goodness for the internet and the netbook I took along with me. Just to provide further unsettlement, the couple that's with us used to live in the Hudson Valley and were away for two weeks on a vacation in the wintertime and came home to a flooded home after losing power which allowed the hot water baseboard heating pipes to freeze - which thawed after power returned, bursting the pipes and water poured out. They said the damage totaled $32,000 back when things didn't cost so much. Hopefully, it wasn't so cold and we're okay but it's a great concern as you might imagine. With all that, it's time for bed and a new adventure tomorrow. 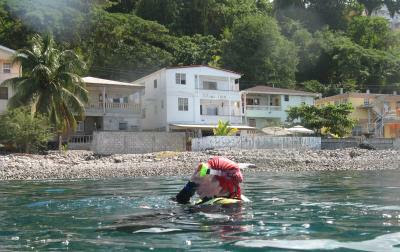 The best place we've found so far for snorkeling in Dominica is Scott's Head at the south end of the island so we took advantage of the calm seas to return this afternoon. As always, the entry is easy with a concrete wall for storing your duffel and a large rock for balancing while putting on your fins and snorkeling gear. The water is amazingly warm this time of year, no problem in getting chilled, even if in the water for 2 hours like today. 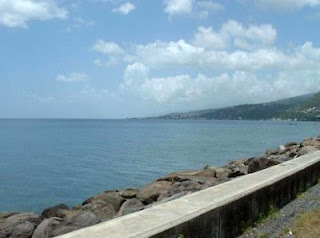 There is a wall to explore to the left that extends around the point and another coral wall that's located in the middle of the bay, both are fun to glide over. As usual I took lots of photos with only a very few posted to the blog. 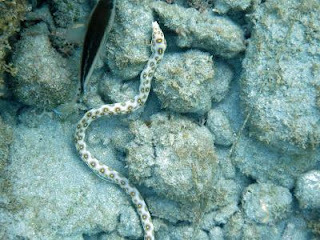 The area has an abundance of eels along with the usual assortment of tropical fish although they tend to be small compared to other places we've snorkeled like Bonaire, Grand Cayman and the BVI. The turtle was back again, I guess he has a home in the bay. We also saw the same school of squid, quite large on average. Perhaps not all would enjoy two hours of snorkeling but we do like it. It's very peaceful and beautiful to watch the underwater life move by. We'll probably be back before we leave. The winds have finally calm down somewhat. We waited out this morning for the wave to subside and headed for the south end of the island, Scott's Head. 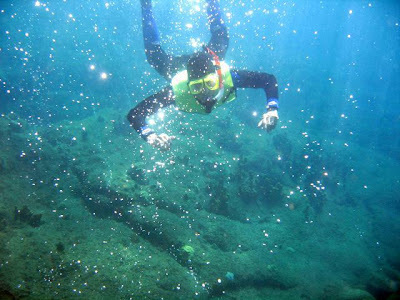 It's the best snorkeling we've found so far on the island. When we arrived in the afternoon we found the protected area to be as calm as a lake, perfect snorkeling. 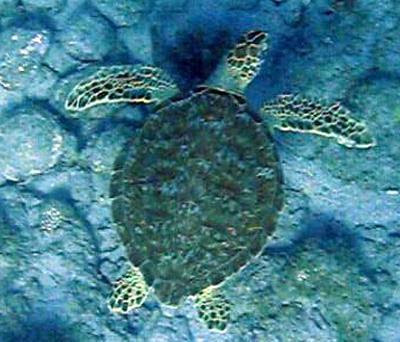 There is a concrete bulkhead that provides a convenient place for donning and storing your gear and a large rock in the water for balance in putting on your fins and other snorkeling gear. The area has a coral wall to the left as you head in and another coral bank in the middle of the bay. 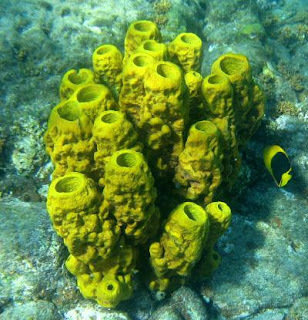 As before, we saw an excellent assortment of colorful sponges but not a lot of large fish. There were plenty of juveniles but not mature forms. I went around the end of the left wall but didn't see a whole lot and headed back along the shore. Along the way I ran into a turtle! I shot a movie of his graceful swimming, it's magical seeing his swim so effortlessly and with such grace. 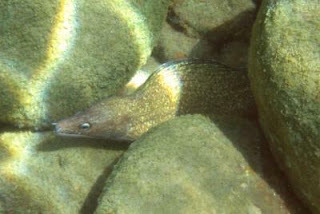 Eels were out in abundance and we caught one out in the open (see photo). However, we haven't seen an octopus yet, still looking for that one, maybe tomorrow. The wind roared last night out of the west with the result that the waves that crashed onto our snorkeling beach were even higher than yesterday. The boats moored out in front of the condo were violently rocking side to side as they oscillated with the waves. Part of the day's entertainment was watching people come in to the dock with their dinks and trying to get out safely with 2 to 3 foot waves coming through. We were concerned about one older couple when the wife couldn't get back into the dink for the ride back to their moored boat. A local helped her into his wooden boat and then transferred her to her husband's dink. 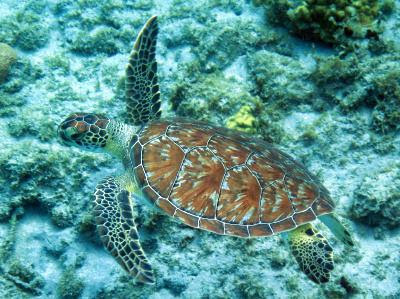 They are out there right now, bouncing around in the waves as we are watching the Olympics. 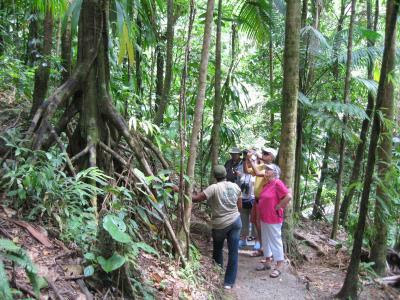 With the surf too big for snorkeling, we paid a visit to the Dominica Botanical Gardens. They had beautiful specimens of the local plants and we enjoyed the visit. 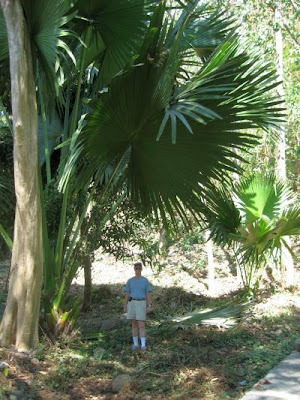 One thing to get used to is that many of the plants just grow larger in the tropical environment, larger than you'd expect. On the way back we discovered the best grocery store, the IGA in the middle of town, advice to anyone thinking of coming to Dominica. Once again we're hoping for calmer weather on Wednesday. I heard over the news that Lagrangeville is getting hit with 6 to 12 inches of snow with another storm on the way Thursday! Nice being down here. The weather was beautiful as usual but the waves rolled in with some force so it was not a good day for snorkeling. The boats on the moorings in front of the condo were really rocking side to side, it could not have been very comfortable for the sailors. So we had a late breakfast and mostly lazed around all day and enjoyed the warm breeze, sunshine and the pool. It was a very relaxing day. Around 7:00 pm we had a Skype call to our grandkids in Connecticut and enjoyed seeing them on our netbook which also displayed a webcam view of us to them. There's no charge for Skype and it can be used anywhere in the world with an internet connection although you ought to have at least a WiFi speed connection or faster. 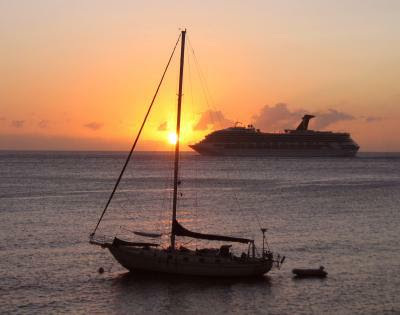 For our sunset view, we saw a huge cruise ship depart at sundown headed south. 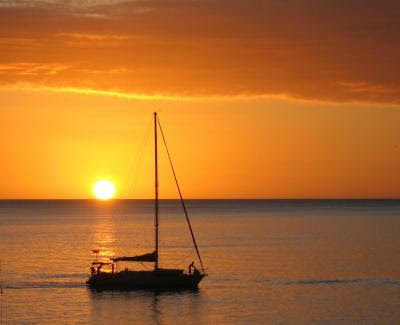 For the most part, the cruise ships travel at night so they can spend the days in various ports across the Caribbean. As you might expect, when a cruise ship is in port, the town is very crowded! Given that, we avoid town when they are in if we can. We hope to snorkel tomorrow. 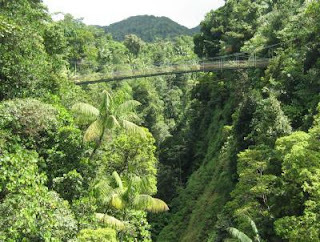 Dominica has a rain forest up in the mountains and a tram ride through the canopy that sounded interesting so we decided to give it a try. It's run by a company that also has similar tram rides throughout the Caribbean. The installation is massive and looks like it could stand a mag 7 earthquake. Everything was flown in by helicopter, we're told, since there was no access for such large structures via the local roads. By the way, the drive up to the facility in our rental car is an experience not to be missed (ha!) The road was recently blocked by several landslides and we went by a half dozen road crews cleaning out the debris with one lane traffic in many places. If you've been reading this blog you already know how narrow the roads are and how fast everyone (except me!) drives. Narrow roads aren't that much of a problem given our experience in France and elsewhere in the Caribbean but what continues to make the Dominica driving experience unique is the road design that includes a right angle, concrete gutter along the edge of the road you would normally expect the shoulder to be. If you go over too far to avoid a careering oncoming car, your tire will disappear into the depths of the gutter (about a two to three feet deep). We watched that happen to the van in front of us as he was trying to avoid a rather large bus. Luckily, this time the gutter was on the inside of the road instead of the outside where there was a hundred foot cliff. Adding to the adventure is the steepness of the roads, approaching 40 degrees in places! All with blind curves, slippery gravel and the ever present oncoming dump truck loaded with gravel. However, we eventually did find the place and bought our tickets for the tram ride ($64 each). We road in a car suspended from overhead cables, just like at a ski resort. We glided through the forest canopy and were captivated by the the 100's shades of green of the plants, amazing. Halfway we stopped for a short hike over to a suspension bridge over a gorge 350 feet below. Everybody elected to go (not everyone always elects) and the view down was electric. 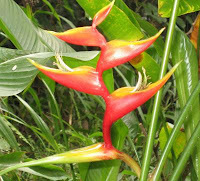 Along the way we admired the Bird of Paradise flowers shown in the photo and were given a close up and person tour of the largest trees on our way back to the tram. 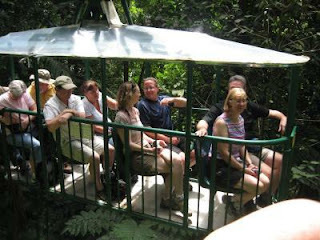 On the way down, the tram rides along the top of the canopy for a different view of the forest. At the bottom we collected ourselves and prepared our nerves for the car ride down. We had wanted to have lunch at a famous local restaurant but took a wrong turn, wandered around awhile on the narrow, steep roads just for kicks and eventually found the restaurant after asking a few of the locals. 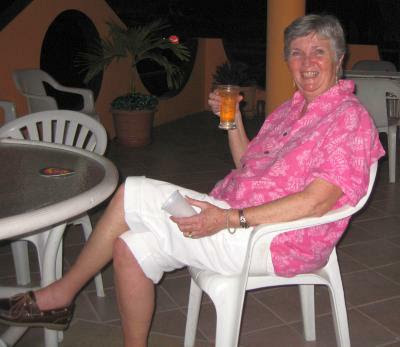 I must say that the people on Dominica have been the friendliest of any we've met in the Caribbean! They are always ready to help. I've never seen them angry in the dense traffic of town and they always give way to pedestrians. After lunch we headed home for our customary rum punch on the porch while watching another beautiful sunset, what a day. We drove down to Scott's Head for snorkeling this morning. 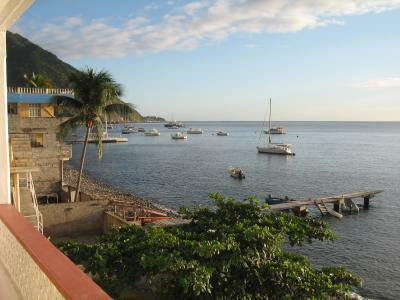 It was a beautiful, warm day, as usual in Dominica - what a place. 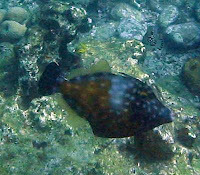 Scott's Head is located on a long sand spit with a very protected snorkeling area. 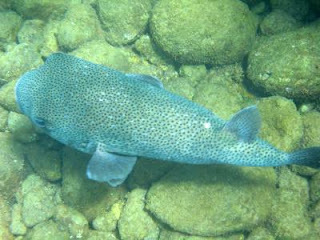 It also has a convenient rock at water's edge we used for balance in putting on our fins and masks. 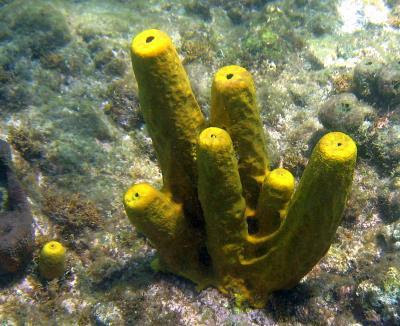 Once out in the water, we found an area with lots of brightly colored sponges. There were not many fish and we thought they may have served locally for food. 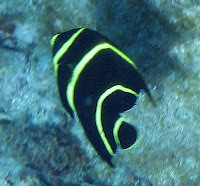 The ones we did see were quite small but it was still a good snorkel. I took lots of photos as usual and samples are included. The trip there in the car is a real adventure with the lack of a shoulder and, in fact, a sheer drop where the side of the road ends. With oncoming traffic squeezing you over it can be quite exciting careening along. We usually missed by inches, literally, the oncoming traffic. 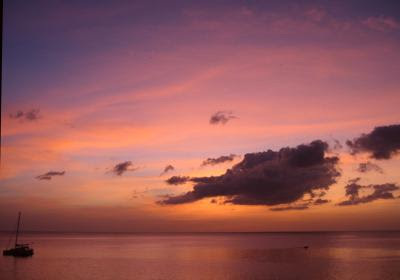 We saw another beautiful sunset over rum punch. Can't think of a much better way to spend a winter's day! 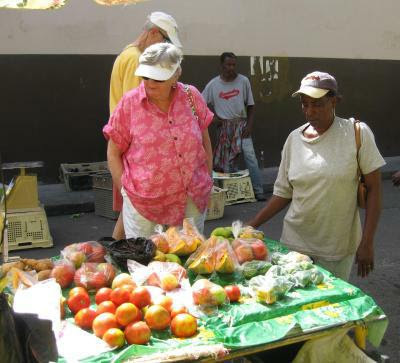 On Saturdays Dominica has open markets for fresh produce so we drove into town to take advantage of the shopping. Additionally, there was a cruise ship in town so the crowds were dense. However, the availability of fresh fruits and vegetables was a great attraction despite the crowds. Driving into town we had the usual tight spaces to squeeze through but even with all the traffic, we never saw an accident and everybody stopped for pedestrians to cross in front of them, a very polite people. Ann and Liz bought bananas (still on the stalks), grapefruit, limes (they don't seem to have lemons for some reason, only limes), lettuce, avocados and more. It was a feast of fresh vegetables. Since the cruise ship was in, many vendors were out in full force with their wares. I bought a cap with Dominica on the front for $4.00, a good buy. Later we went out for a relaxing lunch, followed by a dip in the pool and a watch on the balcony for the sunset with rum punches, not a bad way to finish the day. I can really recommend Dominica. The water out front looked pretty calm so we opted to snorkel right outside the condo this morning. There's a wooden pier about 100 feet down the beach that we're allowed to use so we headed that way late morning. Getting in the water was a challenge since the last step of the ladder was even with the water. We wound up walking along the rocky bottom, holding on to the pier and looking out for urchins, not good to step on! Once in the water we found it very warm, the warmest we've even experienced in the Caribbean. I took a photo of the condo we're staying in with Ann in the foreground, the Titiwi Inn. It's right on the water but does back up to a very busy road with constant traffic. 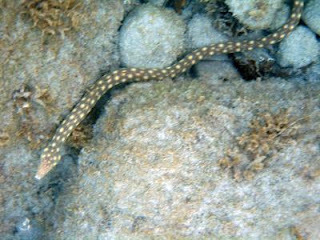 There is very little coral but we did see some interesting fish including two eels and several highhats. In all, it was a calm snorkel but lacking in coral. We'll try further down the island tomorrow. Driving around Dominica is an experience. Speed limit signs are posted here and there but nobody pays any attention to them. The roads are one equivalent to one lane in the US but have to accommodate two way traffic. Just to make matters more interesting, many of the roads have a drainage ditch right at the road's edge, about a foot deep that would catch a tire really well. So you have narrow roads, high speed traffic, pavement that ends in a vertical ditch by the road - and - you're traveling on the left side of the road, like the British in a car with the steering wheel on the right. Adding to the mix, Dominica has 5000 ft mountains and you're constantly going up and down very steep roads with blind curves (you usually honk when you get close so oncoming traffic will get over). So far, so good. We did find a grocery store with a reasonable selection for the Caribbean, mostly with brand names you don't see in the states. Then we headed out for exploring. Seeing an oncoming car headed towards you at high speed in a road that's barely wide enough and a drop off on your left is exciting. The passengers have learned to keep all hands and elbows inside the car, there's no room outside when passing. We made it to a very pretty location at the end of the island (see photo at top) that promises to have a good snorkeling spot that we'll try tomorrow. One thing we've learned is that if you stop an ask directions or if you listen to someone tell you about the local areas of interest, they expect a tip. They start out at $20, nothing cheap about the local requests! We learned not to ask, besides, we wanted to explore ourselves. We ended the day with a drinks on the balcony viewing a lovely sunset followed by a shrimp dinner and bridge. A nice day. We left for the airport at 8:30 am for our 10:00 am flight and had the usual frustrations with ticketing but finally boarded the plane by 10:15, nobody is in much of a hurry around here. After sitting on the tarmac for 45 minutes we discovered that the LIAT had overbooked the flight and was trying to find a volunteer to get off - which they eventually found. The flight reached Dominica about 2 hours late. The next adventure was the trip to Titiwi Inn. Dominica is a mountainous island with some approaching 5000 ft!The taxi ride was a wild affair on narrow roads, no shoulders and deep ravines for the unwary. Somehow we made it okay and we're finally relaxing and resting up for the next day, what a trip to get here! We left on Monday for the Newark Airport before any bad weather arrived and met unexpected heavy traffic. I guess we didn't figure on the President's Day return home traffic in the afternoon. We still stopped along the way at Interstate Diner in NJ for a late lunch before completing our trip to our hotel for the night. I found a special where you can park your car for free for 14 days if you stay overnight one night. The hotel, the Hilton, offers free shuttle service every 20 minutes right to the terminal. Our flight was due to leave at 9:15am on Tuesday which is why we stayed overnight Monday since there was a chance of snow that morning. Sure enough, there was a light snow as we left in the shuttle for the airport. Arriving at the airport, we used the Elite service check-in which was much faster. 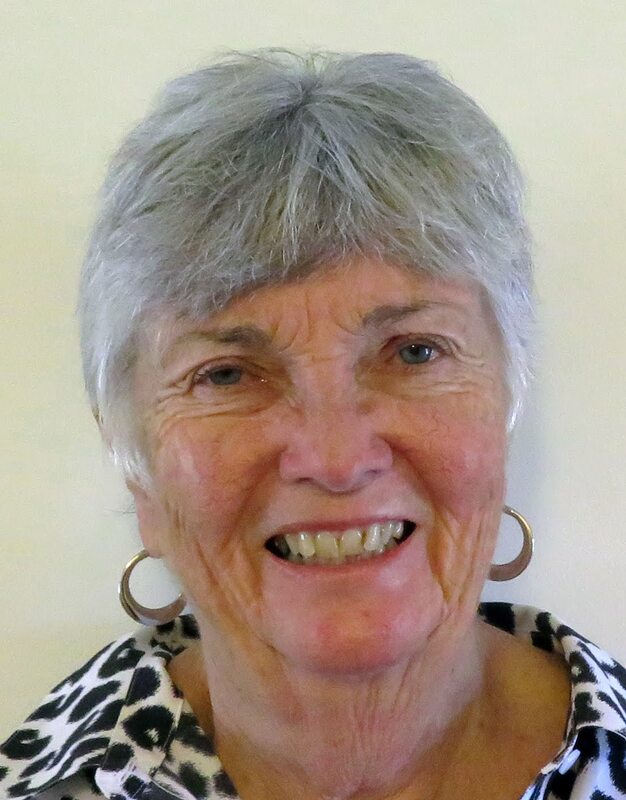 For some reason, Ann received an invitation to join the President's Club which includes no charges for bags, quicker check-in and the use of the Continental Lounge while waiting for the flight. Free WiFi was included along with newspapers, mags, orange juice and coffee, nice. Our flight was late arriving but not too bad, we boarded at 9:30 instead of 9:15 but then the trouble started. There was two navigation computers on board and the pilot reported that they didn't agree, a no-no. So we sat on the tarmac for 1 hour and 45 minutes while they sorted that out. That delay guaranteed that we would miss our connection with LIAT for the flight to Dominica since we had to fly into Antigua first. Groan! Sure enough, we missed the flight and went to the LIAT counter to discover there were no more flights out that night! With that we scheduled another flight for 10:00 am the next day at an additional charge of $80. Apparently, Continental Airlines and LIAT do not have a ticketing agreement on delayed flights, it's everyman for himself. To add insult to injury, LIAT charged an additional $60 for our third bag! So we head for the nearest hotel for the night and had a night cap and dinner at the upstairs restaurant. We were the only ones there.